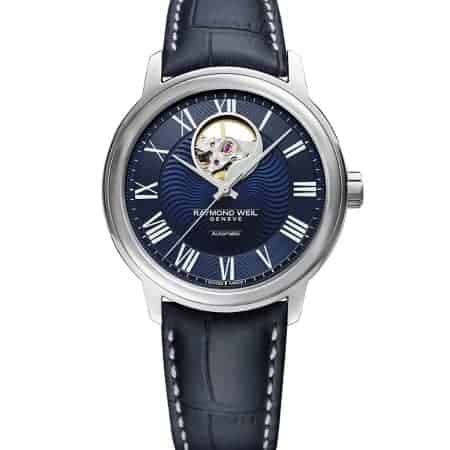 Though the world of men’s watches can be overwhelming, there is a handful of established watchmakers who can be relied upon for absolute precision; and Raymond Weil gives us functionality par excellence. Successfully fusing modern technology with old watchmaking techniques, the Raymond Weil team works with extraordinary attention to detail. 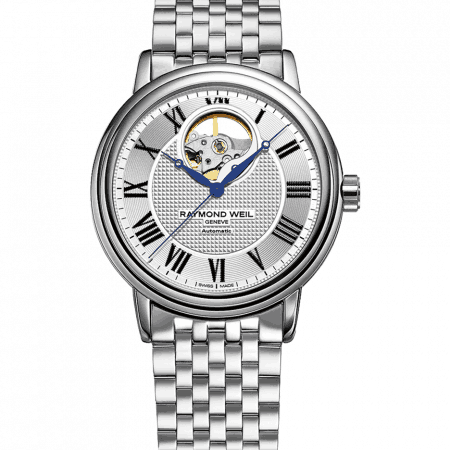 The Maestro is a signature watch in the collection by Raymond Weil Geneva. The look is richly diverse; you can choose a Maestro on a leather strap with minimal numerals, a classic gentleman’s stainless steel bracelet with skeleton dial, or a modern watch featuring the moon phase dial. They’re all Maestro, and all different – to suit the wide range of gentlemen who appreciate the art of Raymond Weil. 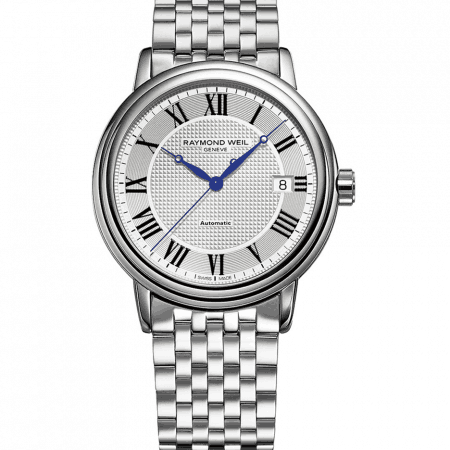 What is the common thread linking Raymond Weil’s Maestro? Based on the same movement with the same strong lines, bold outline, wide dial, and excellent legibility, the watch features 38 hours of power reserve and a double layer of sapphire crystal protecting the face. The reverse of many of the Maestro models features a clear back, allowing for examination of the movement, which is an interesting and impressive detail. 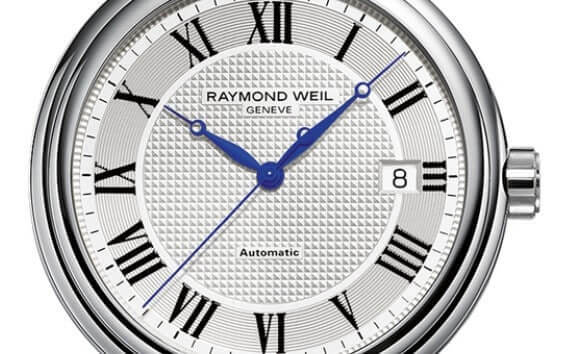 Raymond Weil often advertises on the basis of its stylish and changing design aesthetic – but perhaps underplays the high-performing functionality of its watches. On the wrist, the Maestro is extremely comfortable with unusually good clarity; an advanced and really sensible men’s watch. Previously outsourced to ETA, the movements for Raymond Weil watches have always been excellent. “Precision Movements” became the house slogan in 1994. But in 2017 the watchmaking company launched its own exclusive movement, Caliber RW1212 (named after the RW HQ postcode), which had been developed with Sellita. 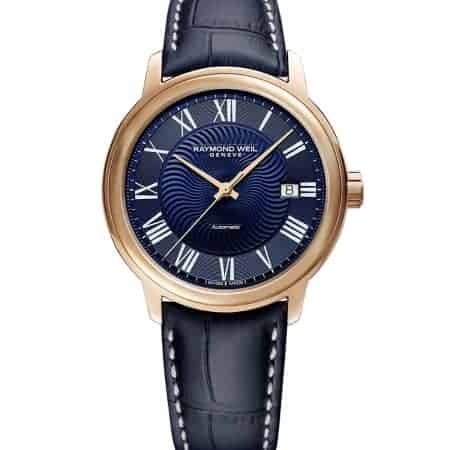 You can find this 28,000-vibrations-per-hour movement in several of Raymond Weil’s new men’s watches – which feature pared-back mechanics to show off the new technology – and expect to see it rolled out through all of the ranges.